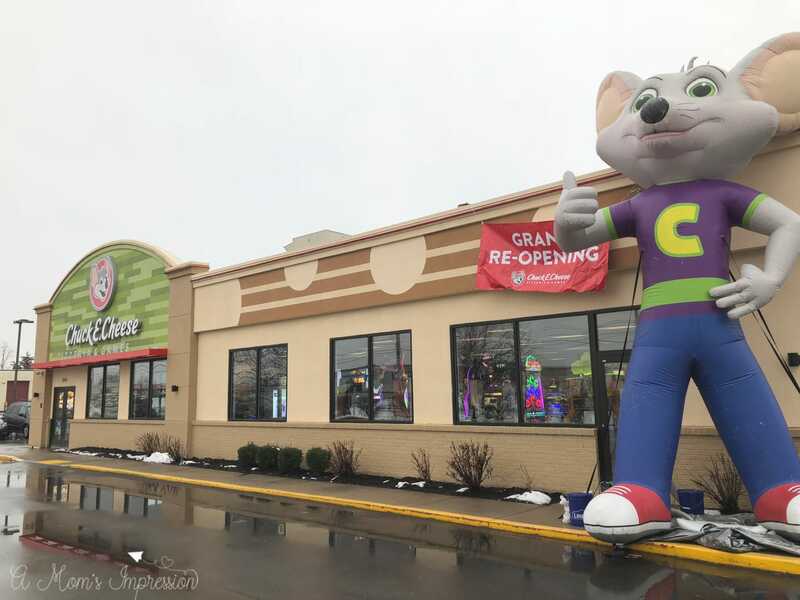 I was recently invited to attend the grand reopening of the Castleton location of Chuck E. Cheese’s. 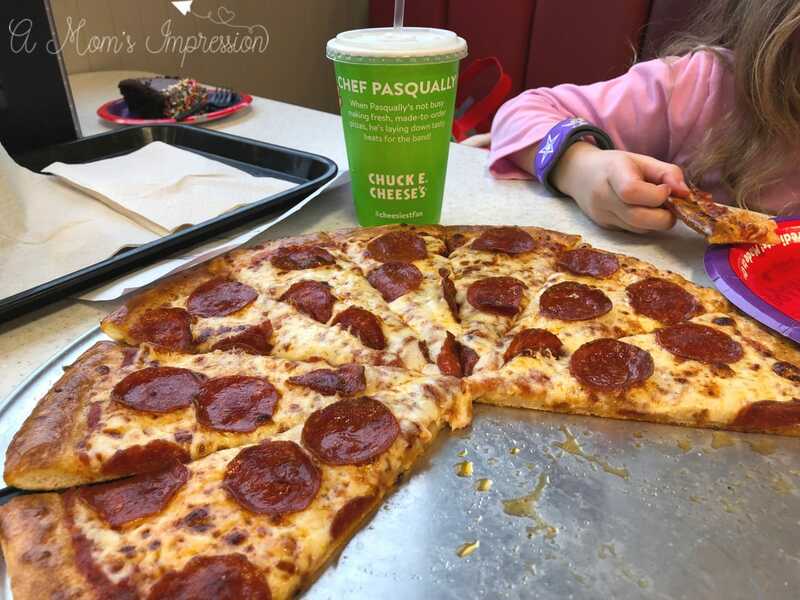 Chuck E. Cheese’s has been a mainstay in family food and entertainment for 40 years. I certainly remember going to them when I was a kid, and now that I am a parent, I’ve been to plenty of birthday parties there. Heading to the grand reopening, I was interested to see how the newest remodel has changed the look and feel that they have had for the past 4 decades. When I pulled into the parking lot with the kids, I was impressed with what they have done with the exterior of the restaurant. The colors are much more modern and it boasted a sleek and inviting design. 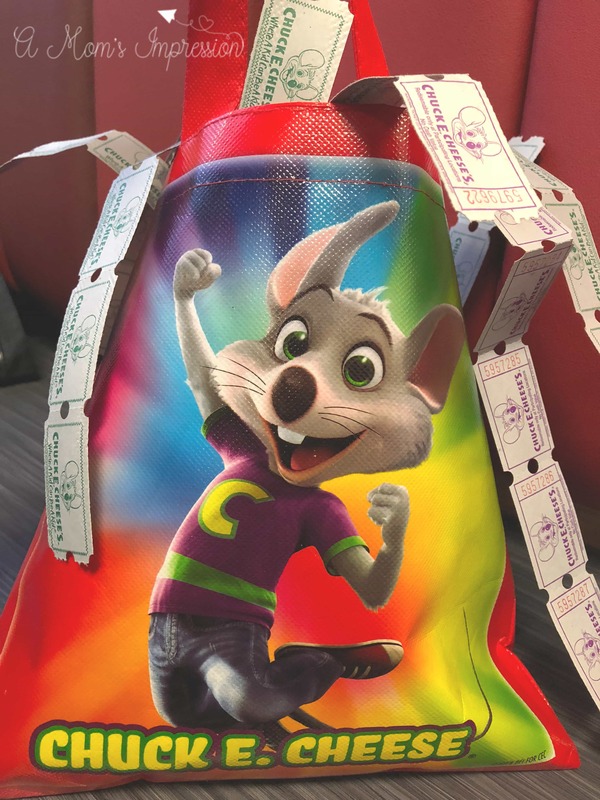 This was my first indication that Chuck E. Cheese’s has seriously upped their game. Entering in the front door, we were met with the greeter in charge of stamping our hands. This method of security hasn’t changed, nor did it need to. The staff at the front door does a great job making sure the kids leave with the same adults they came in with! This is pretty important. Once inside, we met with Mike, the General Manager. He did a great job in getting us up to speed on all of the changes that the restaurant has gone through in the past couple of months. While telling us about all of this, we gave us a goodie bag full of great stuff for the kids to make the evening as much fun as possible. 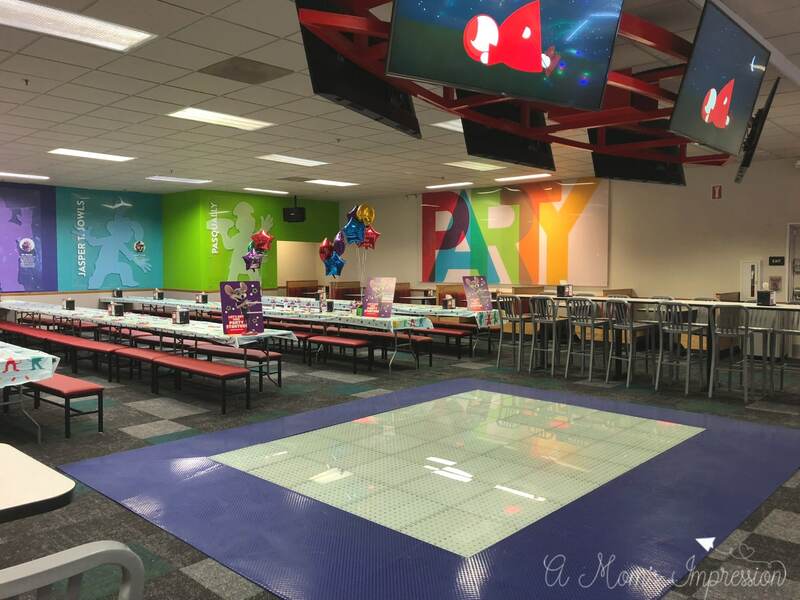 Mike told us that the new Chuck E. Cheese’s is focusing on food. They are making their pizza dough from scratch every day and the newly remodeled store features open kitchens. This allows the guests to watch the pizza making action. There are self-service kiosks available to help parents order food in a simple, fast and easy way. They also offer a lunch buffet Monday-Friday from 11am-3pm. The buffet is located right next to the kitchen is full of fresh and fun options. As I looked around, I felt that there was much more of a restaurant atmosphere in the building. The ambiance is filled with neutral tones, streamlined graphics and warm wood that gives everything a much calmer and inviting feel. 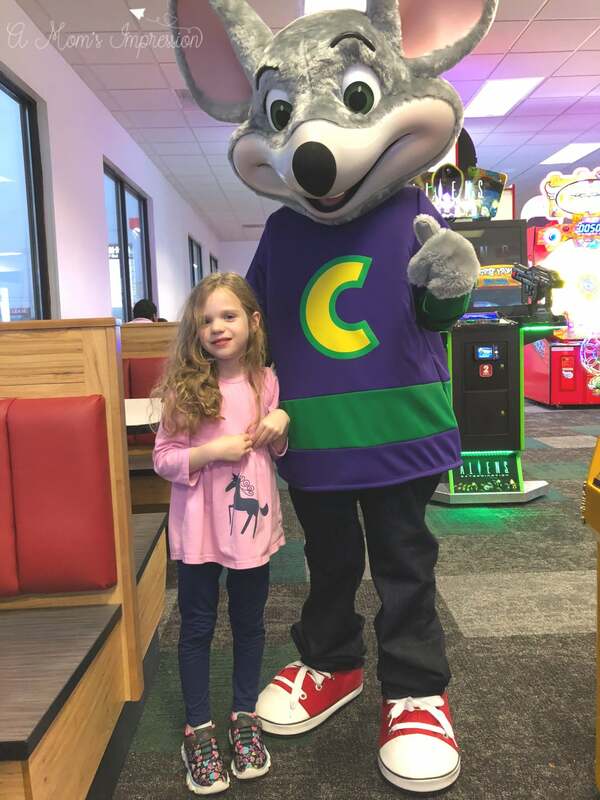 Gone are the animatronics that Chuck E Cheese’s is famous for. But, I didn’t miss them at all. Instead, they had the characters actually out walking around and interacting with kids. My daughter got to play a video game with Mr. Munch. This is much better than watching machines on stage! They also have a super cool new dance floor. So the hourly shows are now much more interactive and your kids can have a big dance party with their favorite characters. There is also a birthday zone that has plenty of room for parties of all sizes. The different zones are designated by the different characters with really cool looking silhouettes and character biographies. There are also special birthday shows as well. Mike told me that they have almost all new games now at Chuck E. Cheese’s. 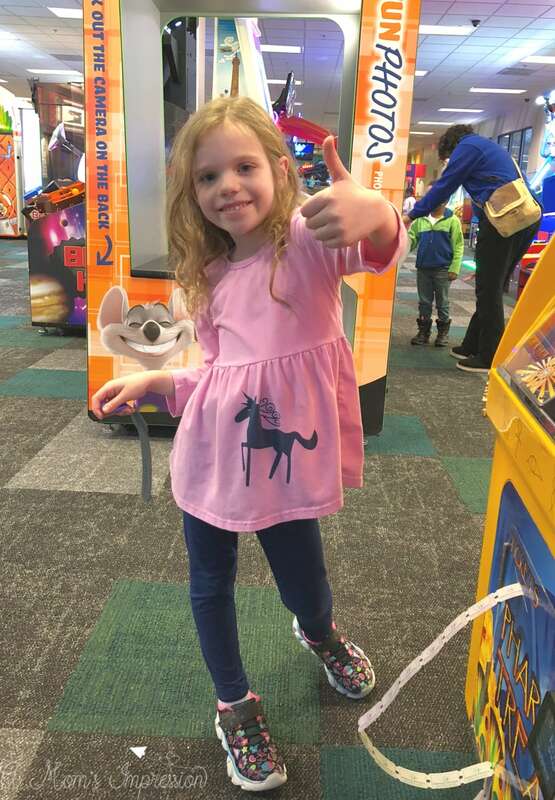 There were still some of the classics that we all know and love like Skee-Ball, but they have certainly updated and upgraded with vibrant, fun and modern games. I also loved Chuck E. Cheese’s All You Can Play pass. This is a wristband that is loaded with a specific amount of time to play the games instead of tokens or credits. Our pass had 90 minutes on it but there are several different packages that you can purchase. This was a great way to enjoy the games. You can even go to a kiosk and pause the playtime if you need a bathroom break or it’s time to dive into the pizza. You can also add time if you run out. The All You Can Play pass was definitely a game changer. It took a lot of the parental stress out of monitoring their game playing. Now, they could roam around and play whatever they wanted! It also meant they were able to win a lot more tickets. 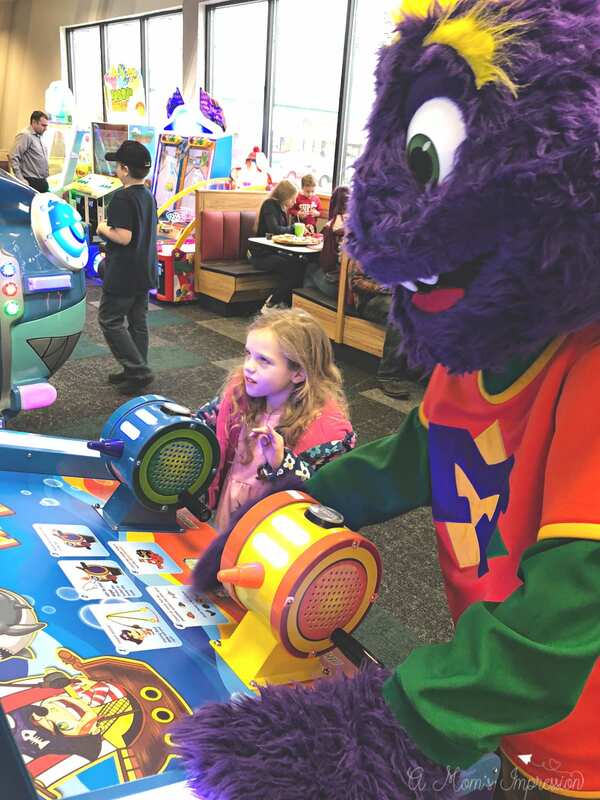 We had blast at the newly remodeled Chuck E. Cheese’s in Castleton. As a parent, I absolutely loved the way it looked, felt and operated. But, as always, it still the place that a kid can be a kid!